When my friends came to visit Singapore they wanted to explore the Singapore modernism combined with the progressiveness, the locals are famous for. And what a better place to do so, then Singapore’s 21st-century botanic garden, a fantasy land of futuristic bio-domes, high-tech Supertrees and whimsical sculptures. Gardens by the Bay consists of three waterfront gardens Bay South Garden, Bay East Garden and Bay Central Garden, with Bay South Garden being the largest. Surrounded by greenery, lots of open places and eateries, the park is a great place to check out nature albeit in a structured and well-planned environment. 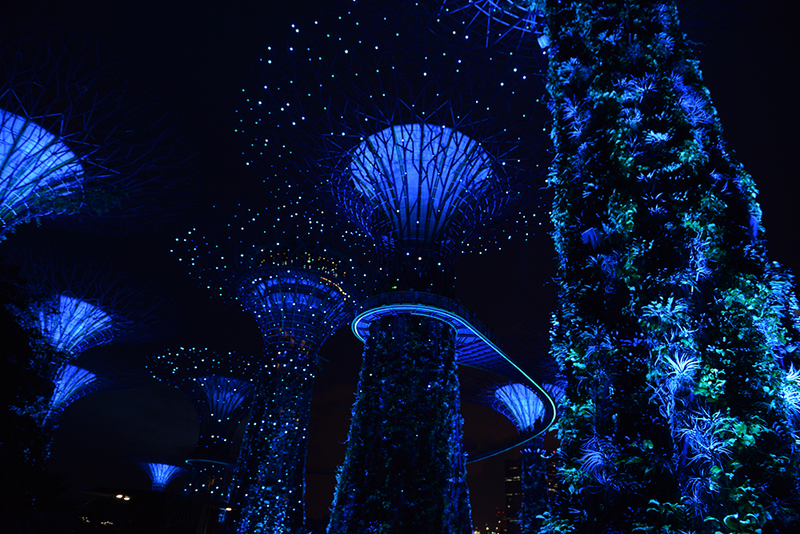 Gardens by the Bay’s landscape is dominated by the Supertrees – a vertical gardens that are beautifully lit up during the night. These Supertrees are surrounded by dense greenery and well manicured lawns. Gardens by the Bay from Marina Bay Sands’ Skypark. Personally, my favorite time to visit the Gardens is during the light show, when all of the Supertrees are lit up in magical colors. This is also one of the busiest times to visit, with queues starting from the park’s entrance all the way to the OCBC Skywalk’s ticketing counter. What to say, everyone want to take that perfect photo of the Gardens by the Bay showered in blue and white. Gardens by the Bay Supertrees are beautifully lit up in color. 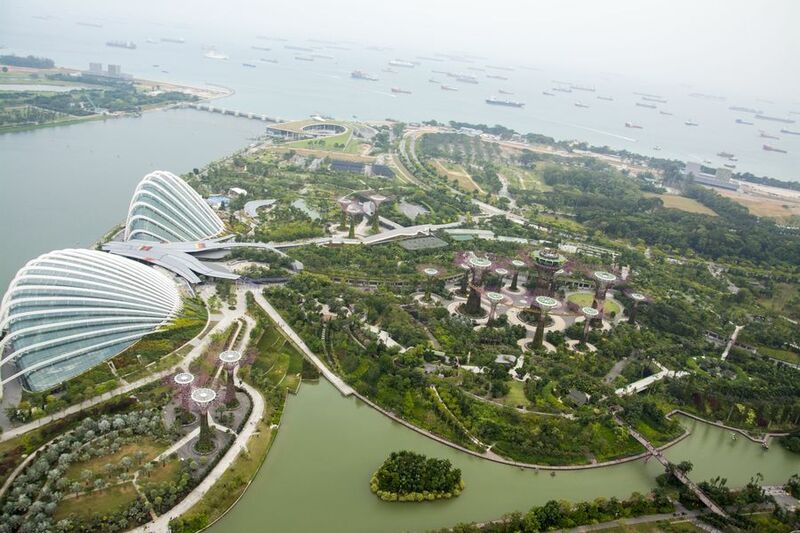 Gardens by the Bay is an integral part of a strategy by the Singapore government to transform Singapore from a “Garden City” to a “City in a Garden”. The stated aim is to raise the quality of life by enhancing greenery and flora in the city. The Supertrees are complemented by the Flower Dome and Cloud Forest, both of which are paid to enter. Gardens by the Bay are equally pretty and make for the perfect photo opportunities both from the top of the near by super hotel, Marina Bay Sands, and from the ground (I prefer to marvel at them from a lower altitude).